The outgoing Minister of Transport and former Speaker of the National Assembly became the first person to declare his intention to be Speaker of Parliament. The declaration by Sitta, the retiring Urambo East legislator comes just one day after the Acting Clerk of the National Assembly, Mr John Joel, formerly opened the contest for the seat by asking Political parties to submit names of their candidates for the post. Having not contested his Urambo East legislative seat, Sitta who was Speaker between 1995 and 2010 is now vying for the seat under as non-legislator. Under the constitution, a non-legislator can be Speaker as long as he or she has the qualifications to be a legislator. The Electoral Commission has to certify that such non-legislator has the qualifications necessary to be one. Sitta, having been both a legislator and Speaker certainly has the qualifications. Sitta’s interest to return as Speaker was revealed by his spokesman, Mr John Dotto. Dotto further revealed that Sitta, who would be vying on the CCM ticket, believes that he has the capacity to deliver. “Mr Sitta believes that he has the capacity to perform as evidenced during the 9th Parliament”, Dotto said. 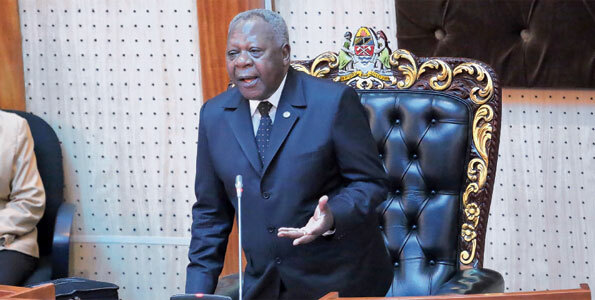 Having presided over a parliament which debated a number of high profile public matters and even witnessed the fall of several government big wigs including then Prime Minister Edward Lowassa, Sitta won the hearts of ordinary Tanzanians. But when his attempt to seek re-election in 2010 saw some CCM party bigwigs, including some who had been adversely affected by parliament during his tenure, openly and covertly oppose him. And so, it came to be that his former Deputy, Ms Anne Makinda was elected to replace him. Sitta also rebounded in 2014 to chair the Constituent Assembly (CA) that was charged with making Tanzania’s new constitution. It is perhaps fair to say that his ranking for performance as CA chair depends on who or which side you ask as the constitution matter remains one of the most hotly debated issues in the country todate. So acrimonious were the debates and process that the opposition and some independent representatives walked out of the assembly before it finished. It is also the constitution making process that bore the coalition of opposition parties known as “Umoja wa KAtiba ya WAnanchi (UKAWA)”, that just gave the ruling CCM party a bloody nose in the just concluded general elections. Earlier this year, Sitta was also one of the 38 candidates who sought nomination as Presidential flag bearers of the ruling CCM party. It will therefore be interesting to see how a CCM, that that has had to content with a ‘meagre’ 58 percent win by its Presidential candidate John Magufuli, who had to preach a sermon of change, will deal with Sitta’s mixed-bag candidature.